Unleash your flight of fancy with this Birds and Hearts design from the Garden Collection. This design focuses on imagery and fantasy with exquisite and stunningly detailed artwork in this pattern. 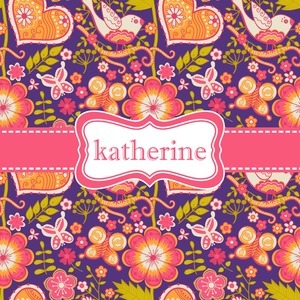 Rainbow birds, swirly hearts, and flowers that radiate all in colors of pink, orange, and green pop out of the design set on a purple background.